JANSSONIUS - Mar di India. JANSSONIUS,J. - Mar di India. Mar di India. - JANSSONIUS,J. Title : Mar di India.. Size : 17.2 x 21.9 inches. / 43.7 x 55.7 cm. Description :This chart from Johannes Janssonius' sea-atlas 'De Water-Weereld' covers the area between the Cape of Good Hope and Japan. It owes its importance to the rendering of the coastline of Australia, which bears the name 'TERRA DEL ZUR'. Of the results of the Carstensz expedition in 1623, only those of the ship Pera on the West Coast of Cape York Peninsula are shown. The results of the voyage of the Arnhem are omitted. The discoveries of the Vianen in 1628 are rendered. 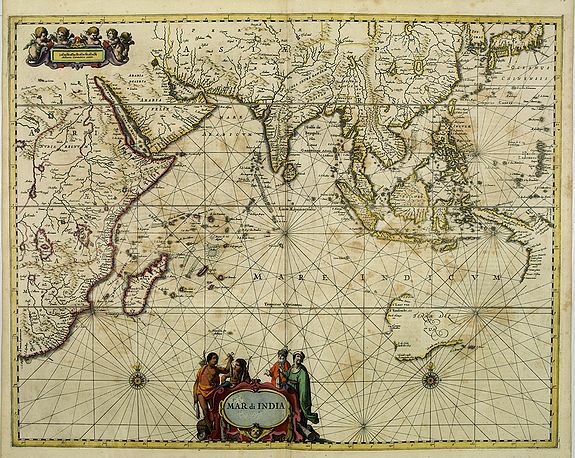 Clancy, The mapping of Terra Australis, Map 6.9: Schilder, Australia unveiled, p.332, plate 45. Condition : Good and dark impression. Paper slightly age-toned with brown spots affecting most part of the image.